This vocabulary guide is a student-friendly dictionary designed to help ELA and history classes tackle the challenging vocabulary in George Washington’s Farewell Address. It includes definitions for almost 250 words and two lessons aligned with the Common Core Language Standards for Vocabulary Acquisition and Use. It is one component of a 61-page Farewell Address Unit Plan designed to cover a variety of ELA Common Core Standards. 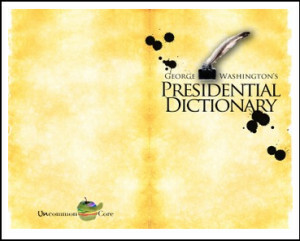 The Presidential Dictionary by Janet Mason is licensed under a Creative Commons Attribution-NonCommercial-NoDerivs 3.0 Unported License.